A flower for the moms, entertainment and great memories. This annual event is one of our most popular and always sells out. 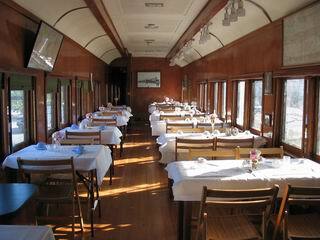 Enjoy a spot of tea and home made goodies on our 1921 passenger rail car, The Venosta. One bright sunny morning after the tables on the car were set for tea, some staff member thought it looked pretty enough to take a picture. I thought I would share the picture and included it in the Blog entry. It gives a chance for anyone who hasn’t had tea at the museum to have a look at The Venosta set for tea. I was at Mom & Dad’s for Mothers’ day so I wasn’t able to make it out for Tea at the Venosta. I loved it the year we brought Mom for it though. I look forward to finding out how it went.